Dangerous relics have been stolen from the Psijic vault. "You see, this happens to be the Vault of Moawita, where the Psijic Order keeps its most cursed relics. It's a tad bit emptier than usual though." Find the Vault of Moawita inside the College of Psijics Ruins on Artaeum. Read the Psijic Codex: List of Dead Drops and make a copy of it. Speak to Glenadir to conclude the quest. 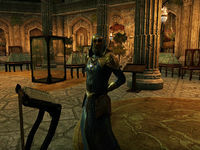 There is no quest associated with actually finding the relics, but a guide to their whereabouts can be read on the Relics of Summerset achievement page. The inscription from each plaque is recorded in a new collection of books named Moawita Memories. I've just learned about the stolen relics. I should ask Relicmaster Glenadir for more details. The Psijic Codex can tell me the location of the relics. I should read it. I've copied down the locations of the relics. I should speak to Relicmaster Glenadir once more. Finishes quest I have everything I need to find the relics. I should speak to Relicmaster Glenadir for my reward.